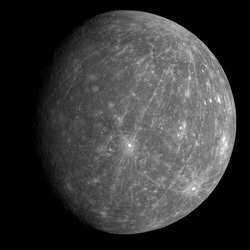 Mercury was known in the anchient greek with the name Hermes, a messenger of the gods, and was most likely named that way because it always moved switly cross the sky. It’s has been known since the sumerian dates (3000 B.C.) and has got two different names from greeks: As a morning star of Apollo, and evening star of Hermes.